Always found it interesting that Jesse's the one character the Saint couldn't kill for good. Considering whom he kills at the end of the series. Yeah, I heard it had something to do with The Saint's powers and abilities not being fully developed by the writer at that point in the series. I think intent may play a part. Cassidy is just someone in the Saint's way, where as the Saint's final target is the cause of all this mess. 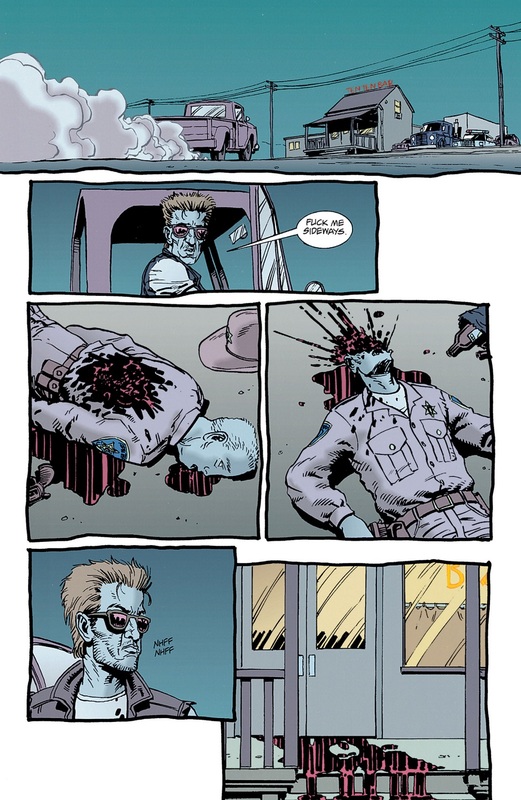 So, where Cassidy ends up mot being dead, the other guy does. If he aimed for the head, he probably could. I suspect it's because the Saint wasn't aware that Cassidy -was- a vampire -- if he knew, he'd probably have aimed for something vital. Well, vital to a vampire. Yep, that's what I assumed when I first read the series. Yeah, from the looks of the exit wound that shot went below his heart, so probably just painful and annoying to a vampire. Though, it does make me wonder what parts of a celestial being would be considered vital. I know that this story is beloved by many people, but I find almost everything about it disgusting. It's like at every point in the story they think "what's the most pointlessly violent and disgusting thing we can do here?" Which makes the ending such a surprise, since technically the world is significantly better off when the series ends than when it begins. But that's only after murdering many, many innocent people in the most meaningless ways possible. 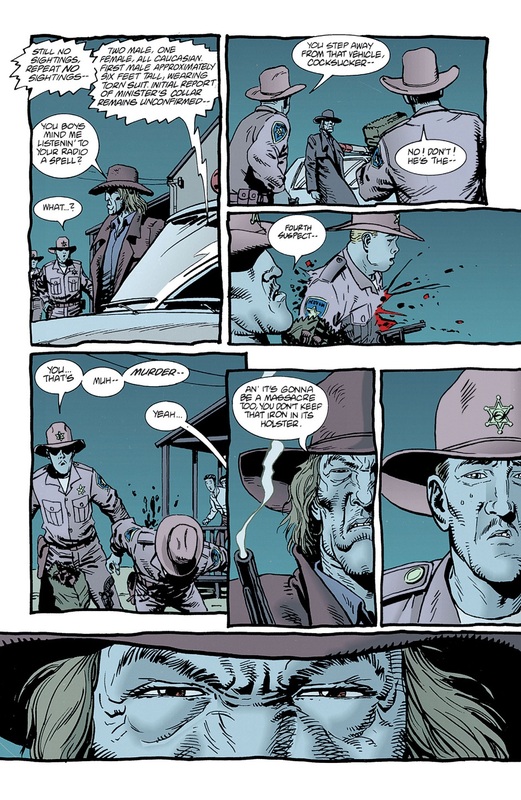 Seriously, why does the saint of killers ever have to kill anyone? He's invulnerable, they can't hurt him or stop him. So he's killing them just for fun. 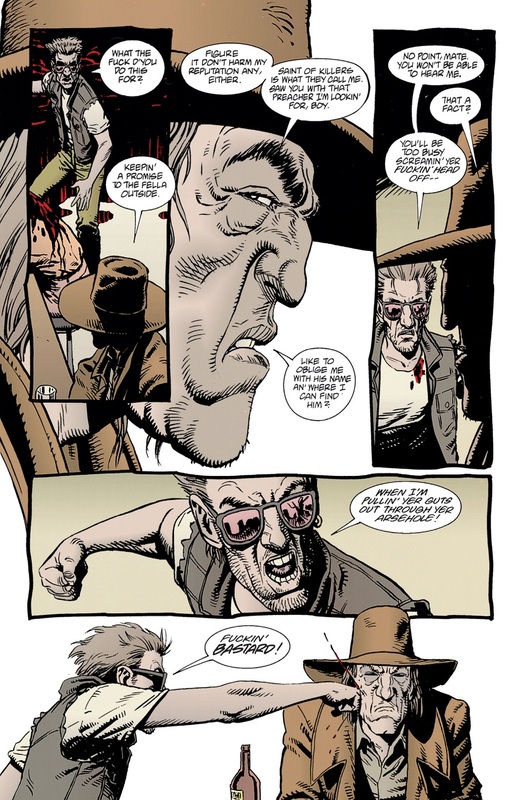 I know the answer is that he's the saint of killers, but I find stories about characters like that gross.
" It's like at every point in the story they think "what's the most pointlessly violent and disgusting thing we can do here?" Yep that's Ennis for you. I certainly don't mind gore but his stuff is just so juvenile. It's like he's going "look at me look at me". 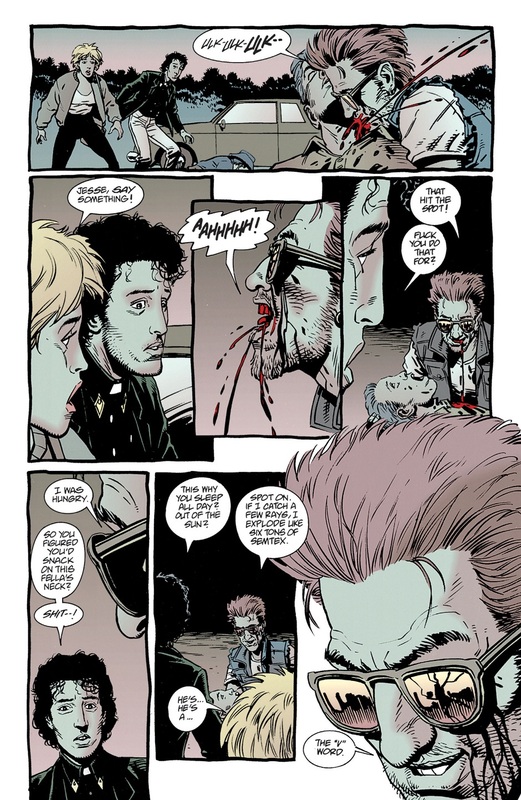 Compare how he does it to how Neil Gaiman handled it in the diner issue in Sandman. Bringing up Neil Gaiman is an interesting comparison. 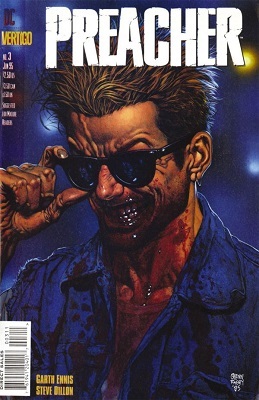 As you suggest, Gaiman can certainly be violent (and I don't enjoy gore), but his work feels much more meaningful. I know we usually argue on a lot of points, but that's a really apt contrast you bring up. Gaiman was writing, or trying to write, horror, and I think in some part of his mind he thought he was literate and sophisticated, like other post-Moore writers from his time thought they were. I don't think he did anything in that issue very different from regular horror comics from the '80s. 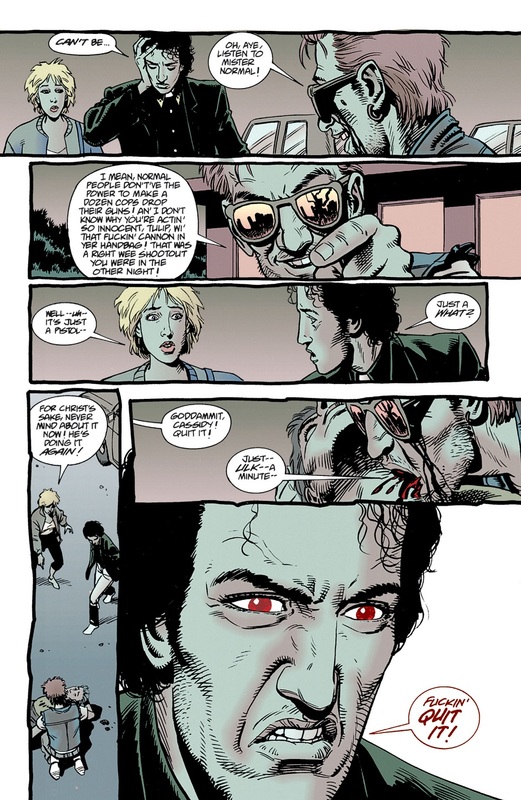 As for Ennis, in every page of Preacher I see a writer revelling in the freedom Vertigo granted him. So why not test its limits? Furthermore, there's something no less literate in his ridiculous routines: his casual, comical approach to violence and crassness, and even the excess he bathes in, owe a lot to Menippean tradition and finds ancestors in Petronius, Rabelais, Voltaire, up to John Barth. Many of the best jokes from Don Quixote concern the beatings Sancho and Quixote take: punches, kicks, horse falls, spanking with sticks and whips, etc, etc, etc, and at no point does the narrator treat all this violence as anything but a source of entertainment. Eh, none of that is present in this specific scene. 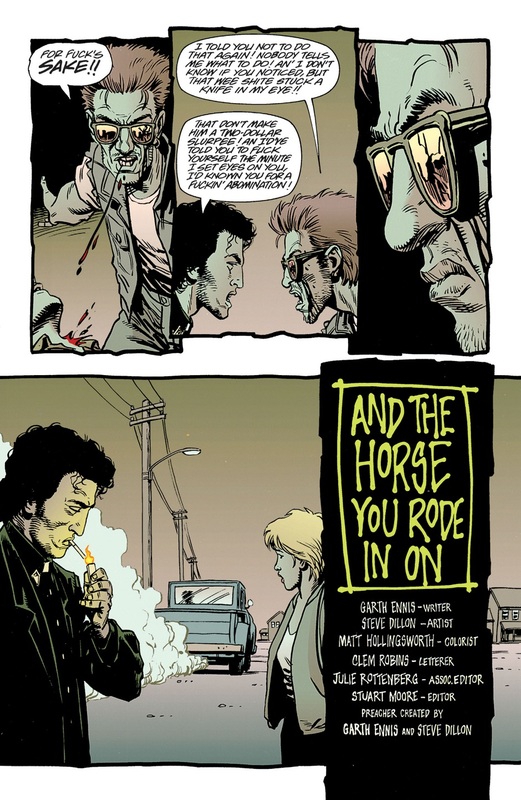 There's no gratuitous piling-on of violence upon a single body. Cassidy just walks in later and sees the aftermath. The Saint himself is all murderous efficiency: he shoots you once, and bang, you're dead. End scene. 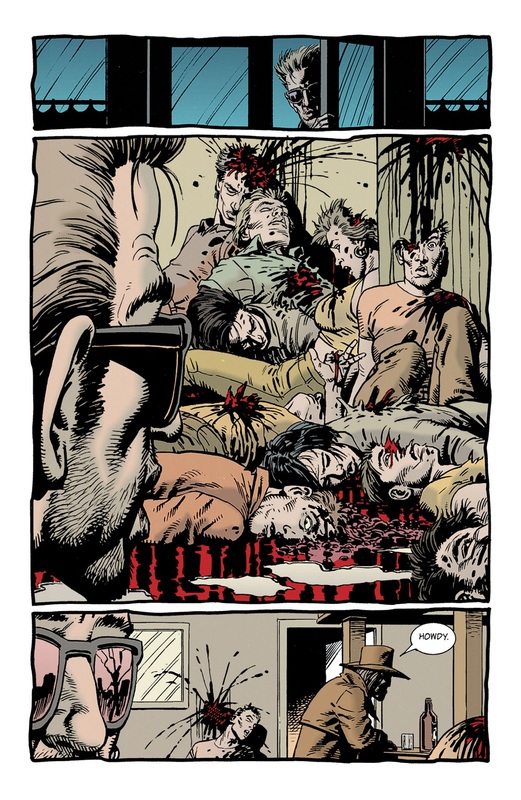 I mean, I agree that Ennis is good at comical violence, but this in particular is a terrible example. No, no, the massacre is pure comedy; here you have a cop who knows he's up against a pretty dangerous guy, and he's told to stay put or else everyone dies; and he goes and draws the gun on The Saint anyway. That kind of dumb obedience to the law is just what you'd expect to see satirized in Menippean satire. 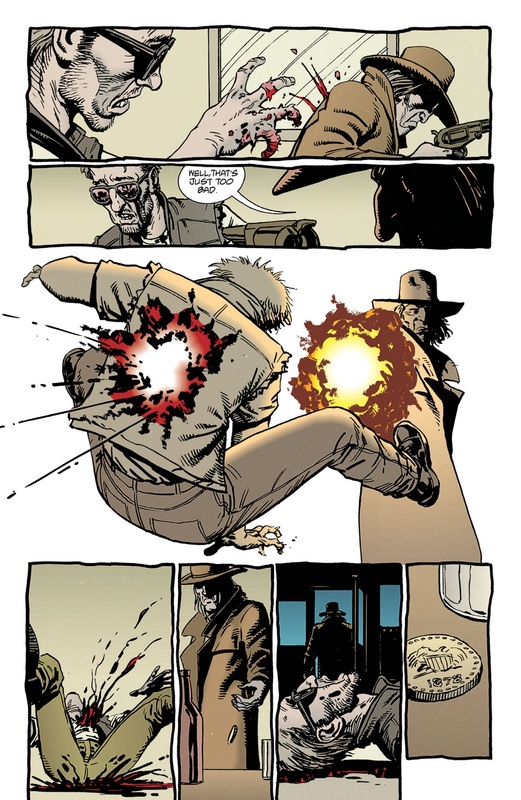 And even Cassidy getting shot is funny because it inverts his role in the series; until then he always come across as stronger than everyone else. It's a good thing Jessie is the protagonist of a story. 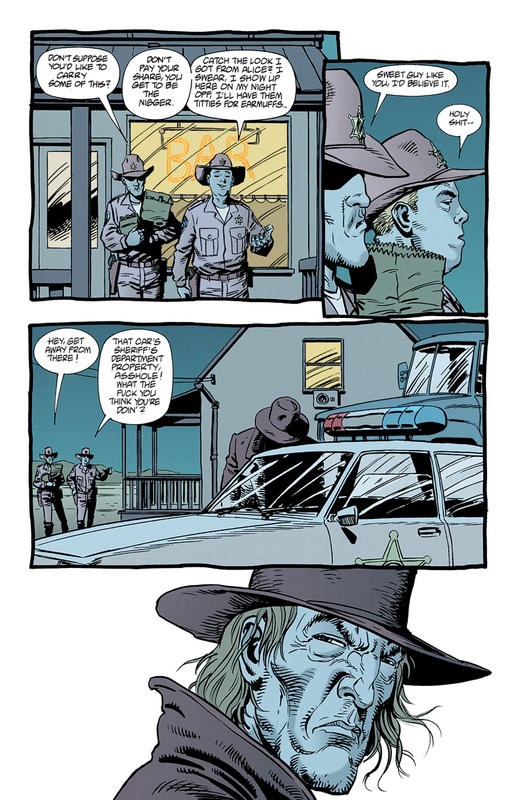 If I were one of these cynical angels in charge of getting Genesis back, I'd forego the Saint of Killers and just drop a big rock on him.